Sevilya Gadzhieva with sign advertising Russian products. The red neon written in Russian caught my eye first. Russian?? In a nondescript shopping plaza along Old Monroe Road where suburban Matthews blends into semi-rural Stallings? The sign heralded tidy little International Grocery. Translated, the neon says “Russian Products” but petite dark-haired Sevilya Gadzhieva behind the counter is truly international. Of Turkish background, her family lived in the Soviet province of Georgia, then got relocated by the authorities to Uzbekistan. Then again to Russia itself. Then exiled altogether. Her shelves offer pickled pickled vegetables from Turkey and salamis from Hungary. 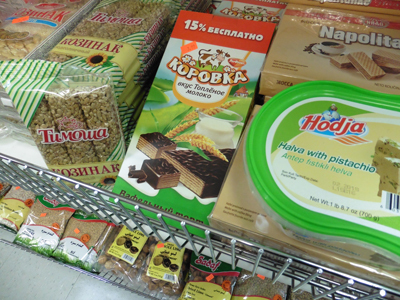 Coolers hold Russian soft drinks and Russian ice cream sandwiches made with wafer cookies. You can buy traditional biscuits for your teething baby or corn-curls with a bright-colored cartoon Russian princess on the box. When I was there, Gadzhieva’s mother-in-law Latifa was hanging out, her hair covered with the old-fashioned Russian kerchief called a kosinka. I headed home with a tall tin of feta-like white cheese from Turkey, a tub of crisp and garlic pickles, plus some halva candy. And one of those Russian ice cream sandwiches for the road. But before making it back to the car, I spied pictures of kabobs in the windows of Athens Pizza across the parking lot. Kabobs?? In a nondescript shopping plaza along Old Monroe Road where suburban Matthews blends into semi-rural Stallings? More on that in next week’s column. Russian nut brittle and wafer cookies, Turkish halva candy. 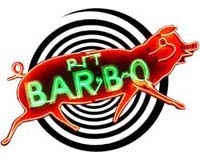 Monday – Thursday 11 a.m. – 9 p.m.